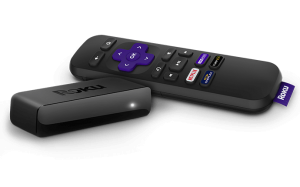 Win a Roku Express Media Streaming Player! From movies and series on Netflix and Amazon, to cable alternatives like VMedia—stream the most talked about TV across free and paid channels with 5x more power than the previous generation Roku Express. The Roku Express includes a High-Speed HDMI® Cable—and there’s no monthly equipment fee. Plus, with access to hundreds of free channels, there’s plenty to stream without spending extra. Free Mobile Roku App: Turn your iOS® or Android™ device into the ultimate streaming companion. Control your Roku player, search with your keyboard. Official Rules & Regulations – Win a Roku Express Media Streaming Player! AGREEMENT: No purchase is necessary to enter the Contest. The act of entering the Contest constitutes acceptance of the Contest Rules and the decisions of the Contest judge. CONTEST: Log onto WhatsYourTech.ca, complete a Win a Roku Express Media Streaming Players online entry form and submit your entry by following the instructions found at the site. The contest starts at 12:01 am Eastern time (ET) on February 7, 2019 and closes on March 6, 2019 at 11:59 pm. All entries must include your full name, e-mail address, mailing address, and ten-digit telephone number. One entry per person.Entries received on-line shall be deemed to be submitted by the authorized account holder of the e-mail address submitted at the time of entry. ”Subscriber” is defined as the natural person who has registered for products or services with WhatsYourTech.ca. Void where prohibited. ELIGIBILITY: To enter and to be eligible to win, entrant must be a legal resident of Canada (excluding Quebec residents) and be over the age of majority. Selected entrants must correctly answer a mathematical skill testing question. Full rules available on the contest site. Employees and their parents, siblings and children, and persons domiciled with an employee of any of the Contest Sponsor, their agents, parent, affiliated or related companies, subsidiaries, divisions, prize Sponsor, and promotional and advertising agencies and administrators, are ineligible to enter. PRIZES: There will be one winner. The winner will win a Roku Express Media Streaming Player. Approximate prize value $44.99. Prize package as described in contest detail. Dealers may sell for less. Prize must be accepted as awarded. The Prize may not be sold, transferred and is not convertible to cash. Contest Sponsor reserves the right to substitute the Prize in whole or in part in the event that all or any component of the Prize is unavailable. Limit One entry per person. GENERAL: On or after February 7 at approximately 4:00 pm. ET, a random draw will take place at WhatsYourTech.ca, Toronto, Ontario from among all eligible entries received during the Contest Period. The odds of winning a Prize will depend upon the total number of eligible entries received during the Contest Period. WhatsYourTech.ca, acting reasonably, will attempt to contact the potential two winners by telephone or email within two (2) business days after the draw. In the event the potential winner cannot be contacted within 2 business days after the draw, he or she will be disqualified and an alternate potential winner will be drawn. Proof of identification must be provided upon request. ERRORS: The Sponsors and their suppliers are not liable for lost or stolen entries or inability to process entries, web site downtime, and inability to access the web site, or any virus or other damage incurred by contestant’s computer system. BANNING: The sponsors may, in their sole discretion, prohibit any person from entering any contest whom they believe to be abusing the rules. Such abuse includes entering false information and entering more than once. CONTEST: Subject to all applicable federal, provincial and municipal laws and regulations. By entering this Contest, each entrant consents to the collection, use and distribution of his/her personal information by the Contest Sponsor for the purposes of implementing, administering and fulfilling this Contest. Contest Sponsor will not sell or transmit this information to third parties except for the purposes of administering this Contest. PRIVACY: Any inquiry concerning the personal information held by the Contest Sponsor should be sent to WhatsYourTech.ca at info@whatsyourtech.ca. Please reference Win a Roku Express Media Streaming Player.